It is not quite as fast as its cousin, but still very hard to photograph! I think you can see the colours quite well, though. And its soft furry body really is reminiscent of a bumble bee! I was so pleased to see this creature, as it is on the list of endangered species in Germany. This entry was posted in Animals/Creatures, Garden, Nature, Wildlife and tagged Animals/Creatures, Garden, Nature, Postaday, Summer, Wildlife. Bookmark the permalink. Amazing photos…how long did you have to wait for him? Pure chance that I saw it… once again I was trying to photograph something else and this liitle furry creature suddenly appeared! Cathy, I admire you for shooting so wonderful photos – especially with butterflies buzzing around so busily. Interesting! I´ve never seen one before. The colours are really different to others of that family. If you find a caterpillar with a pike – its on of a spinghidae. We found a caterpillar once, several years ago, which must have been one of this family… enormous! (We think it was an Elephant Hawk-moth, but I don’t have a photo). I did not know there was more than one. Both are gorgeous. There are actually quite a lot of different ones – maybe a dozen or so in our region. I’ve seen the hummingbird and bee hawk-moths this year, and in the past also a willowherb hawk-moth. All are wonderful! Only time I have even seen one is when Lilacs are in bloom and I am doing dishes and have a hard time getting it perfect in my Lens through the SCREEN so thank you I will sit back and admire your capture! I was so lucky – had the camera in my hand and it just appeared under my nose! 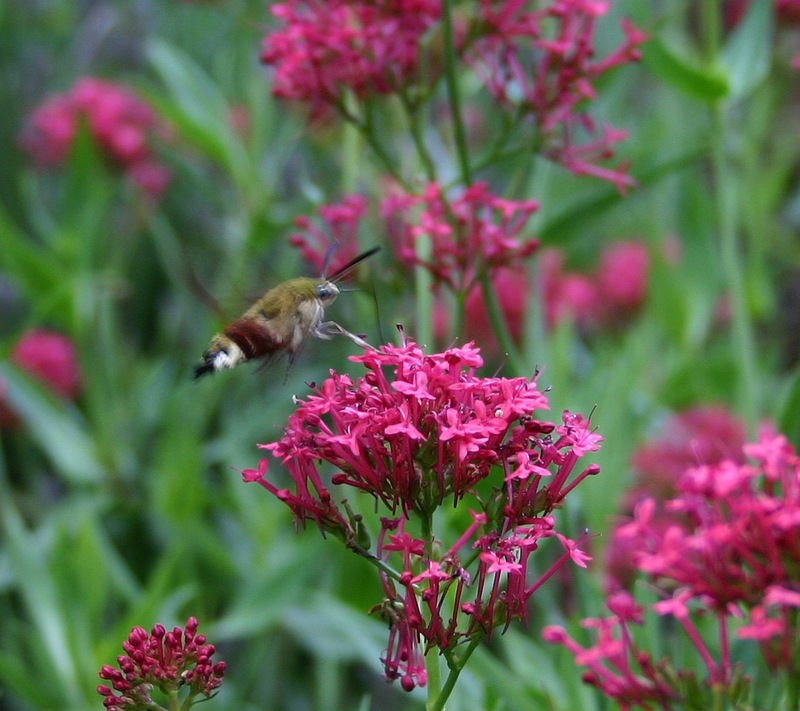 I see a couple hummingbird moths a year. They are similar to yours, but not so colorful. What is that plant, they seem to love it? That’s the Red Valerian (https://wordsandherbs.wordpress.com/2012/06/17/jupiters-beard/). They all love it! He’s gorgeous and great photographs… I’m still struggling to photograph flowers properly! What a wonderful photo…lucky timing for you and a great opportunity for us to enjoy. Hi Karen, glad you liked it – such a cute little moth! It’s hard to imaging but these guys are about the size of a hummingbird sometimes. Hi Snowbirdpress. Having never seen a hummingbird I cannot imagine such a tiny bird! 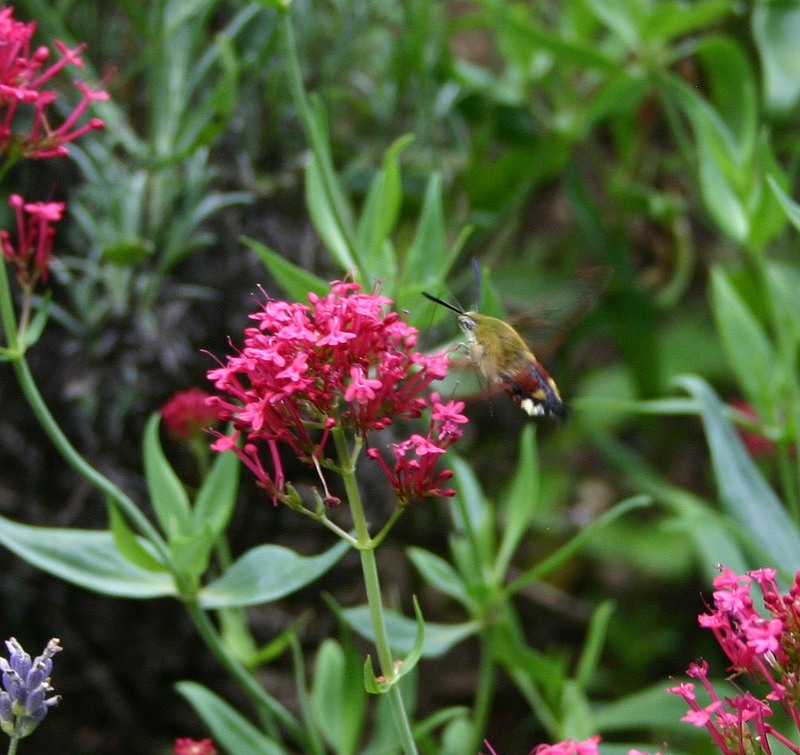 The bee hawk-moth’s wingspan is only about 4 or 5cm – how big are hummingbirds? I´ve never seen a bee-hawk moth before. Very interesting but I probably wouldn´t like to have it somewhere in my garden. It´s a bit creepy. They both are wonderful. It is so interesting to see them so close up. Love it! Hi Tj! I just saw two more… different ones! They are fascinating! Yesterday afternoon I was so lucky to see this cute little creature. Fascinating! schwärmer” und zum ersten Mal den “Kleinen Weinschwärmer” gesehen. Both seem to love my Phlox. I´m happy like a child! What a beauty! I want to see one!